I always shudder when I see the military. I just can't get past the institutionalisation of killing; I can never feel comfortable with an organisation who's primary purpose is violence. It makes me very uncomfortable, frankly it scares the hell out of me. 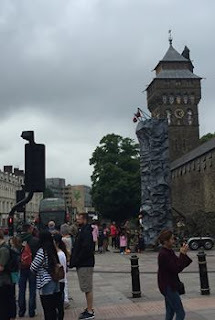 This week I was made to feel this way when I saw the army outside Cardiff Castle, with a climbing wall being used by small children. I saw children and parents queuing up to use the wall. It was half term outside a major tourist attraction. I saw families being shown a massive artillery gun. I saw a child look curiously at a rifle on a table apparently unsupervised (I'm sure it wasn't loaded). I felt sick. I don't want to see weapons of death on a lovely sunny day in my city. It disturbs me to see children being socialised into thinking this is normal, this is OK. This is a kind of a soft PR exercise, an opening for the recruitment of children into the military. It made me feel literally queasy. I felt it in the pit of my stomach. Being a follower of Jesus means my consciousness of such things is heightened. My "normal" is the Christian vision of the kindom of God, the "peaceable kingdom" and so when I see something like this it brings me up as deeply deeply abnormal. I find it abnormal to see objects designed to rip apart human flesh being shown to children. It shocks me. And I look around and wonder how anyone else can think it normal. All I could do was manage a silent prayer on the spot. I prayed for the people there and for peace and earth, then I kept walking. What more is there to do?